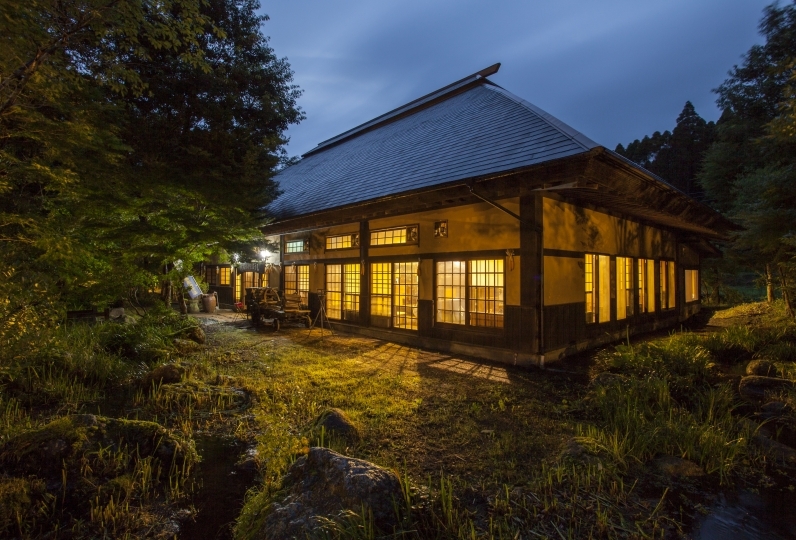 Ryokan Fujimoto is a peaceful place surrounded by abundance of nature. Every tree whispers their invitation to spend time here and forget about you busy life. The building has spacious hallways and a high ceiling supported by beams. 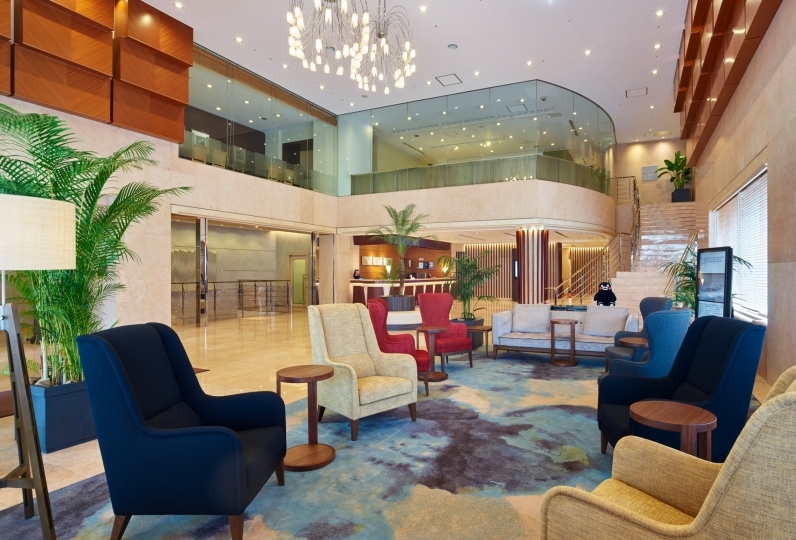 The window in the lobby offers a view of wide rice fields and the quiet countryside will soften your heart. 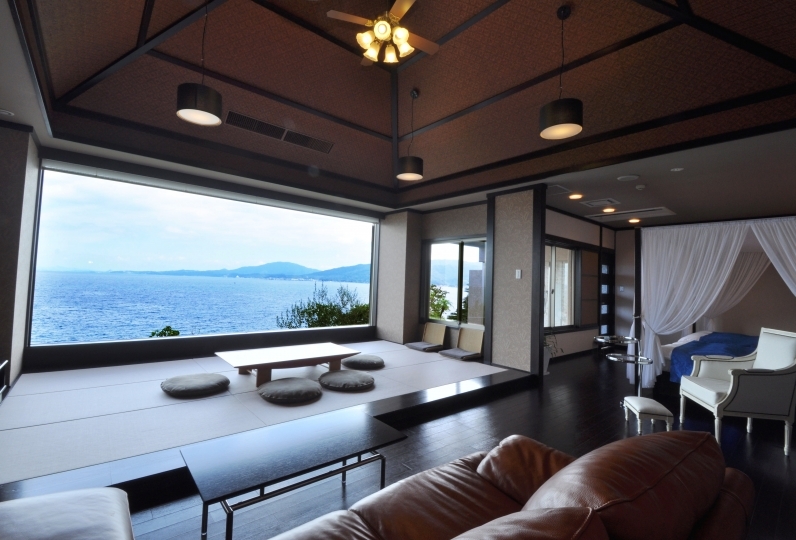 The interwoven light from the sunset changes the inside of the building to a relaxing atmosphere. 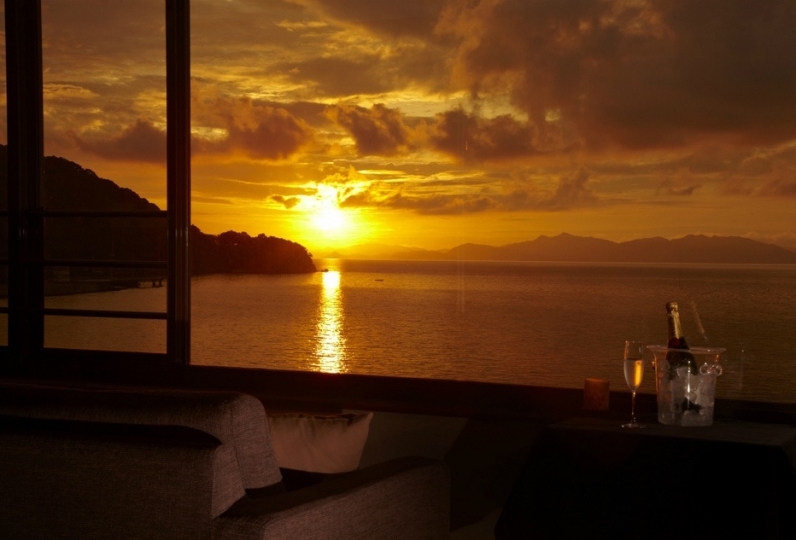 You will be in the best place to enjoy a relaxing time. 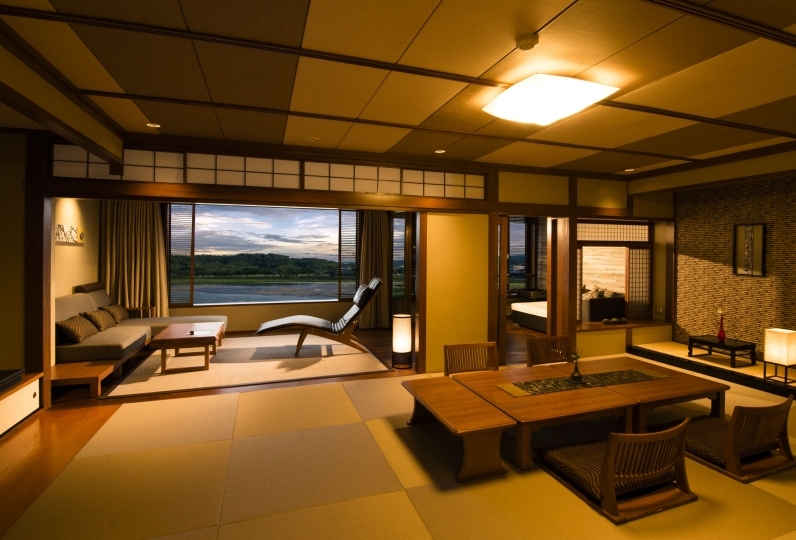 Each guests room plays on the image of a nostalgic countryside. While being in the seclusion of your room, you will be able to admire the colours of the leaves that changes with the four seasons. Please enjoy your ability to just relax and enjoy your time. For dinner, we prepare traditional Japanese cuisine, mixing simple flavors and special local produce. Fujimoto's specialties include "Steamed Seiro Cooking (food steamed inside a wooden box), fresh horse sashimi that melts in your mouth, and fish from the stream grilled with salt etc. The flavors of the produce and its natural deliciousness will satisfy you to your very core. 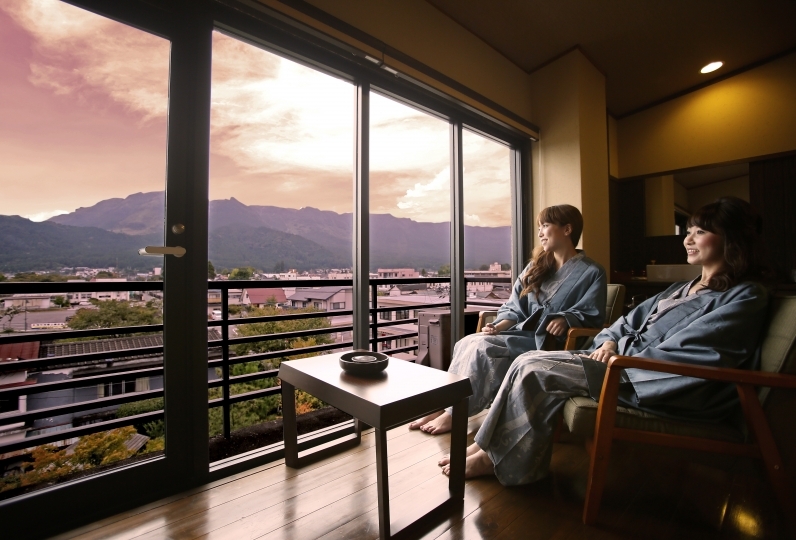 Being able to soak in a bathtub along the mountain is one of the pleasures and overflowing charms of your stay. 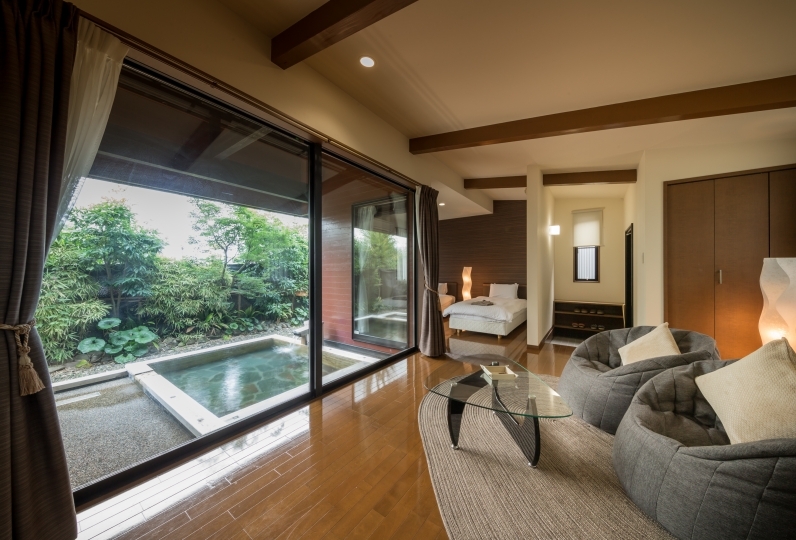 Choose from cypress or stone open air baths, river baths, etc: envelop yourself in varying ambiance while the tender water relaxes your whole body. While being surrounded by the change of the seasons reflected in the grandeur of nature, step away from your daily life and let your mind and body relax. My mother and her husband and I were indebted to three people. The rooms were clean and the meals were seasonal, so we made a discreet plan, but it was delicious enough. I was able to enjoy various kinds of baths. Dare to say that bath and dressing room are old (I wonder if it has an emotion) I felt it was better if the cleaning was a little more thorough. However, I got tired enough with soft water. Thank you for your concern from the beginning to the end. It was satisfying. thank you for helping me. It is really appreciated to the man who arrived at the car pickup, regardless of the arrival being delayed by about 1 hour, than the schedule. The attitude of customer service was really nice and I was able to spend it pleasantly. The meal was also wonderful, especially breakfast etc was delivered plentily, despite being a day when there were few guests, we were able to have breakfast in a rich mood. Outdoor bath was good, too and was satisfied satisfactory. The rice was relatively good, but customer service was normal, bath and room were the worst. There are insects in the room, and the mold is full of mold inside the refrigerator. The bathroom was also smelly moldy, the shower did not come out of water and it was too hot to use. The public bathhouse is usually dirty and mold full of family bath. There were young children in other guests running around the hallway and the noise was so loud that the worst echoed. 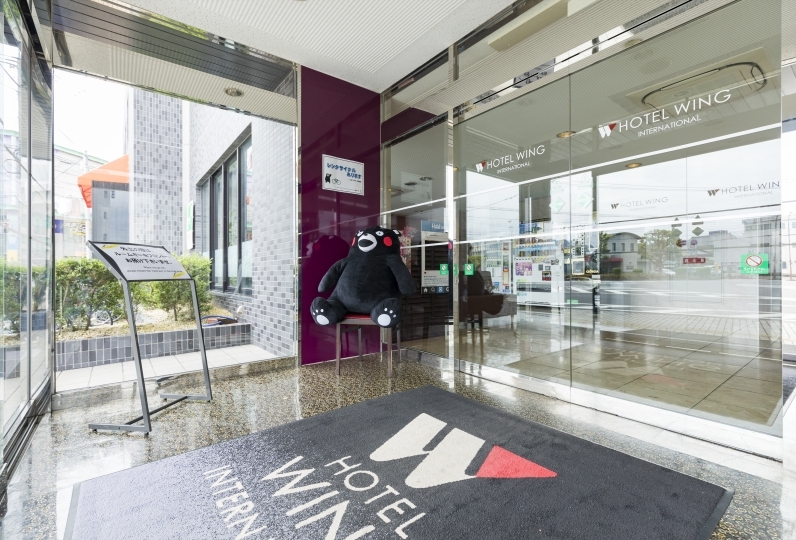 Even though the child can not be helped, it is not an ordinary hotel or a inn, but here we are staying at a reasonable price, so there was not any consideration in the neighborhood. I do not want to go again and I have stayed in Kumamoto several times but I stayed in the worst place. Either way it will be crushed. We change the effect of all the bathtubs in order to enjoy the hot water tour. Please slowly enjoy the hot spring. The large communal bath is separated for men and women. there is an indoor bath and an outdoor bath. The outdoor bath has a tub made of cypress wood and a cut stone. The gender changes in the middle of the night, therefore both men and women can enjoy the different types of baths. Please enjoy the difference in temperature in the outdoor pool: the deep you walk in the warmer it get. In the afternoon, you can feel nature all around. 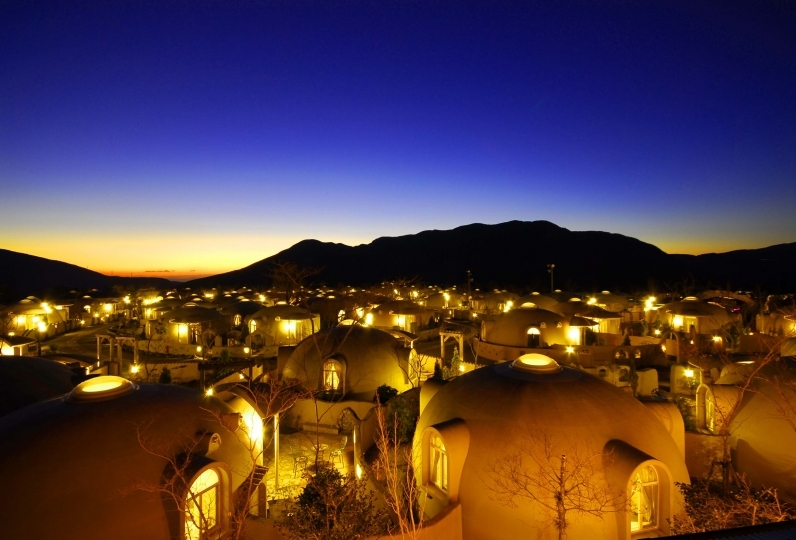 At night, in the illumination of the light, spend a blissful time in the flowing water and let yourself go. Not just the outdoor bath, try the open air bath. Submerge yourself in the water until it reaches your eye level and look across the water, this is one way to enjoy the bath. There aren't any handrails so please be careful getting in and out of the bath. Also, on rainy days, the river may swell and it may be dangerous. On those days, please refrain from entering. The sauna uses heat from the onsen, therefore it isn't very hot. You will be able to stay in for a very long time. 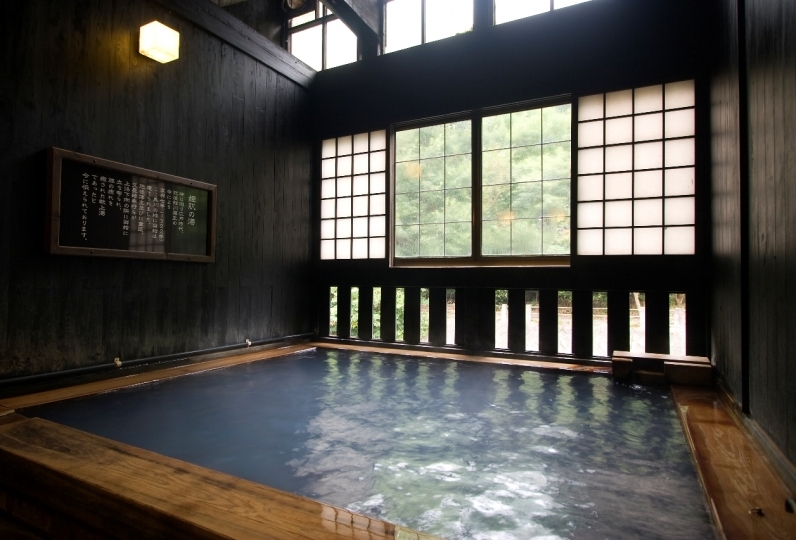 There are a total of 4 private baths that you can reserve, [Masu no Yu], [Maru no Yu], [Ten no Yu] and [Sora no Yu]. Go down one long passage and from the side the inside baths, [Masu no Yu] and and [Maru no Yu] are lined up beside each other. 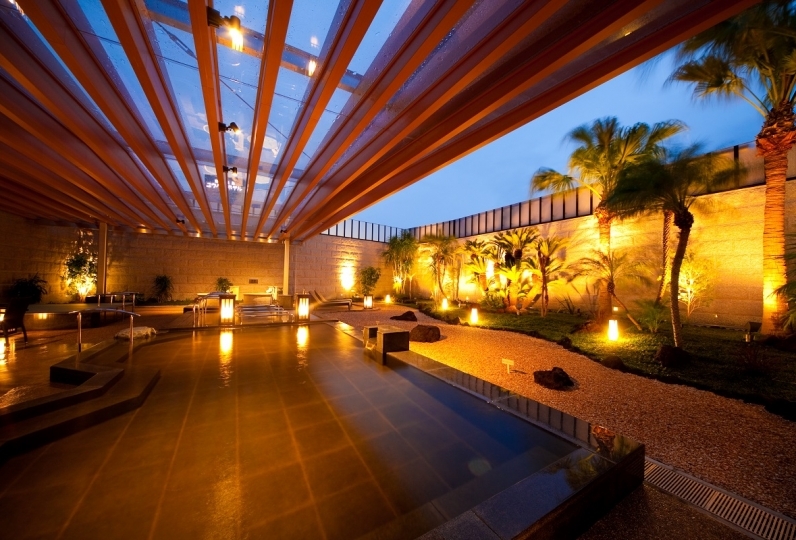 At the end of the passage are the outdoor baths [Ten no Yu] and the stone cut outdoor bath [Sora no Yu]. Taking a bath while you look at the mountain stream below is a special treat. Being able to soak in different types of baths is one of the many things that you can enjoy on this trip. The concept of the library is a "school." Wooden bookshelves and tables will bring a feeling of nostalgia. All the books and DVDs are free for you to rent. You can see the sunlight shining through the trees, hear the sounds of the rustling leaves on the trees of the courtyard, and hear the sound of the murmuring mountain stream. Enjoy the slow movement of time. · There is no pick-up service. Please use Maruke Taxi (0967 - 44 - 0453) once near the Kurokawa Onsen bus stop. - JR Kyudai Hon Line, get off at Hita Station -  get off at Tsuetate - Ryokan Fujimoto. 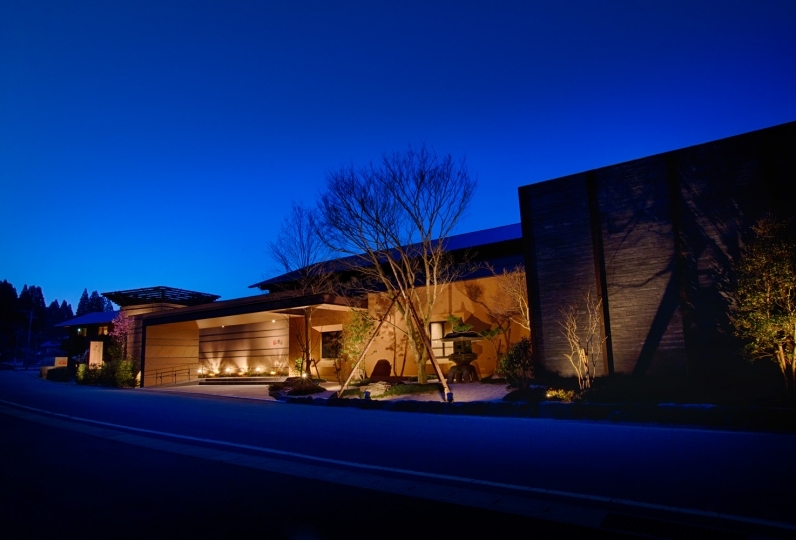 - Fukuoka Airport -  - get off at Hita - get off at Tsuetate - Ryokan Fujimoto. - JR Aso Station  - Yuu Station  Ryokan Fujimoto.